But its a double and so not quite right for the Helice. 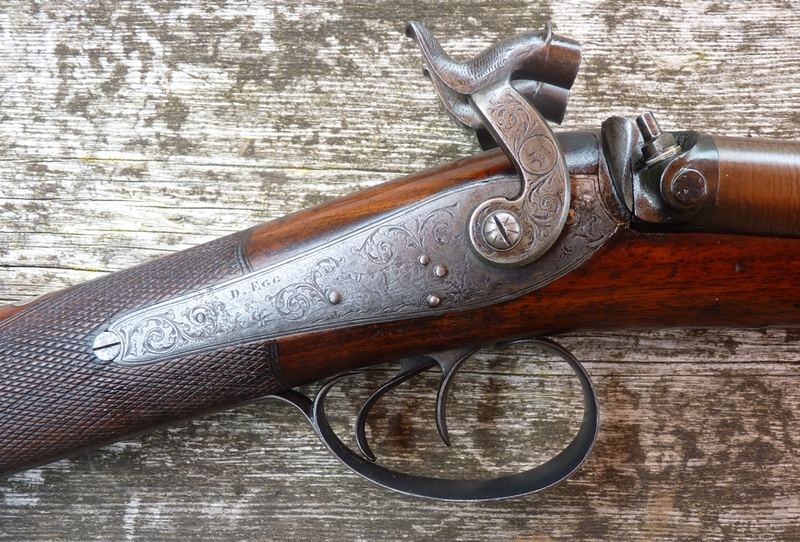 That leaves a choice between my Henry Nock single lightweight gun, or the single Tim Owen gun I renovated (see both below), or I could do the thing properly and use my Gasquoine and Dyson live pigeon gun – a very nice 6 1/2 bore single. The Helice shoot is limited to 1 1/4 oz of shot, which is perhaps a bit of a light charge as when the big bore pigeon guns were popular there was no shot limit, although one came in later. Still, Martin reminds me that Dave Elvin won last year with a 7 bore with 1 1/8 oz so I’ll have a go using 1 1/4 oz No 8 and 3 or 3 1/4 drams of powder. I have broken a couple of clays with the G & D although it is high in the comb for me – but I think that is how the pigeon guns were. Watch this space for the results! Here is a picture of my percussion Gasquoine and Dyson live pigeon 6 1/2 bore single – the absence of a ramrod is clear proof that it was a live pigeon gun, but the combination of large bore and relatively light weight and rather refined finish also indicate it wasn’t intended for wildfowling. 20/7/2015 Back from the Helice Shoot – great fun but I didn’t do very well – I did get 4/12 with the Gasquoine and Dyson shooting 3 1/4 drams and 1 1/4 Oz of No 8 and then changed to the Egg to see if I did better, but it was a mistake and I only hit one of the remaining 8. But a lot of our experts did less well than expected – it is a very different sport and luck plays a big part. A larger than random number of ‘birds’ were making a ‘B’ line off to the left from the left trap and most people found them difficult or impossible to hit. But there was some excellent shooting – the winner, Jane Capewell, managed 14/20 so good scores were possible. No photos as my camera was set to RAW mode and I don’t have the software to read the photos! I have recently acquired a Bond & James percussion 6 1/2 bore live pigeon gun. What load do you recommend? It is of very good quality and very good condition. The bore measures .889 with a snap gauge near the muzzle, but a patch loosens up a bit about ten inches from the breech. It weighs 10.5 lbs. and has a 40 1/2 inch barrel. Sorry I didn’t reply sooner. Sounds a nice gun- My Dyson and Gasquoine is not as heavy as yours so you could shoot a bigger load. It depends a bit on your powder – we use either cheap stuff or good Swiss No 2 at about twice the price, but mostly keep that for flintloTied to a tcks as it goes off faster. A minimum would be 3 drams and 1 1/4 oz of shot, maybe increase to 3 1/2 dr & 1 1/2 oz. A wildfowler using large shot might well load a 6 1/2 bore with 4 dr and 1 1/2 or 1 3/4 oz which would probably be the comfortable maximum for your gun – a 12 lb 6 1/2 bore for wildfowl might shoot a bigger load – some of those boys really pile on the lead! You should be safe shooting 5 drams and 2 oz as a test proof but it may kick like a mule. Remember that powder charge is a very non-linear thing – small increases in charge make a big difference. Too much powder is reputed to ‘blow a hole’ in the pattern and may not all burn during its journey down the barrel. If you have the chance I recommend that you experiment with a pattern plate or barn door and a sheet of paper to see how the gun patterns at each load. The bore widening near the breech was a feature called a ‘forcing cone’ to hold up the shot by increasing the resistance as it got going to give the powder a start. The forcing cone was sometimes roughened for the same reason. Thank you very much. Loading data for something like this has been very hard to come by. I am not a black powder novice as I have hunted both birds and Cariboo, black bear, antelope and elk as well as several deer with a flintlock. However, even though I’ve done a little bit of trap shooting, this cannon both mystifies and intrigues me. Soon, I’ll take it to my local trap club where I usually shoot a hammer Pape, or hammer Bond & James or Cogswell & Harrison and introduce the boys to a “real” gun. May I assume that Goex 2F would be proper in this gun? I’m sorry, but I have no experience of Geox – I and my acquaintances only use black powder _ I think because it is the only thing allowed in international competitions, so it has become my normal by default – it is what its easiest for me to acquire here. I’d use the Vesuvit LC Czech black powder, or Swiss No 2 if i was feeling rich! I think that all powders with the appropriate burn rate for shotguns are graded similarly so 2F sounds as if it should be right, but check! Thanks again. GOEX is a brand name for standard old black powder. Can you tell me why percussion “Live Pigeon Guns” don’t carry a ram rod? Mine looks very like yours. Were they made by a particular maker and then signed by makers/retailers? The reason that they don’t carry a ramrod is that they were used on a shooting ground and there would have been a reloading table that you went back to after each shot. Also on some grounds the weight of shot was controlled, so you had to reload under supervision at the table. Ramrods are a pretty poor tool for reloading – in many years of muzzle loading clay and game shooting I’ve never seen anyone use one, even if they had on in the gun. I did use one for reloading many years ago when a teenager as my father hadn’t discovered loading rods. 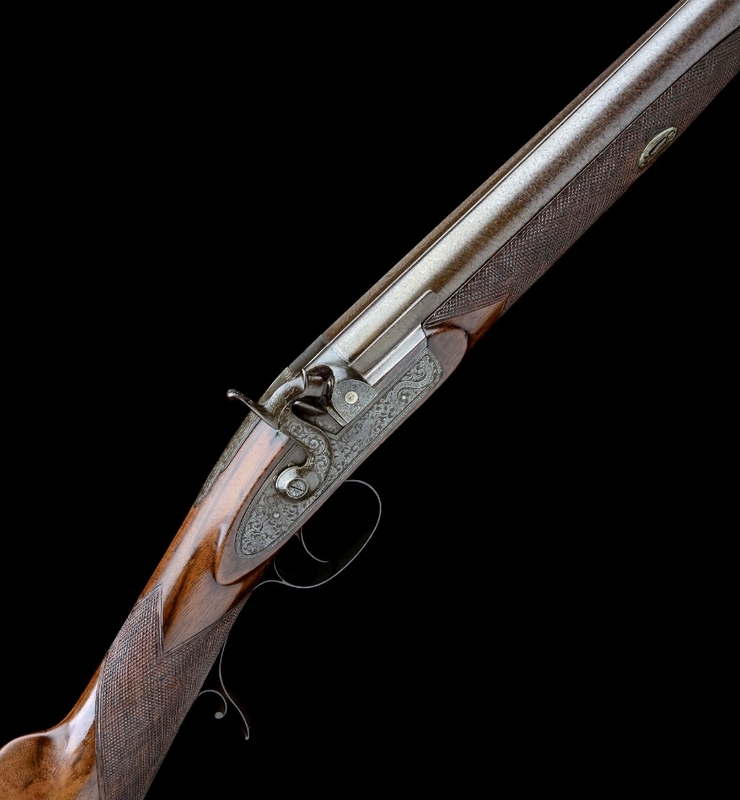 A number of makers specialised in Live Pigeon guns and sponsored crack shots to use their guns in the highly competitive competitions – Lancaster and Gasquoine and Dyson made them, but so did a number of makers. Its quite possible that many others were made in Birmingham and just ‘branded’ for other ‘makers’ or general ironmongers. They traditionally had large bores, – up to 6 bore – but the bore was later limited to 11 bore. Hi James, They are nice guns to shoot, but unfortunately mine fell ove and snapped off the fore-end so I have reverted to my Samuel Nock, which I thin I actually shoot better with.